If you think the Grand Canyon in Arizona is...well...grand...you haven't seen eye-popping grandeur until you visit the State of Utah. I truly think there's no other place like this on earth. Unfortunately they nicknamed this spectacular state the "Beehive State". So probably a lot of folks think it's got nothing but yellow-jackets buzzing around. You would think they could have come up with a more descriptive moniker than that. I suggest they re-christen Utah the "State of Amazement" or the "Stupendous state" or the "You won't believe your eyes state". Utah's rugged and geographically diverse natural beauty seriously wowed my husband and me on our journey throughout the Western United States. 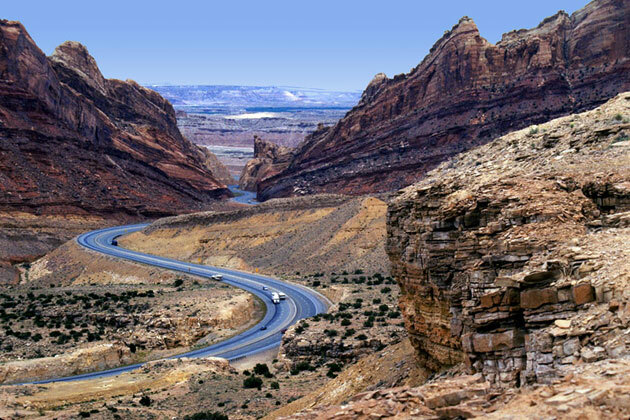 An especially stunning drive everyone should experience to witness first hand the majestic resplendence of our country, is the west-east route on Interstate 70 from Cedar City to Moab, Utah...location of Arches National Park. In a recent post, I touted the benefits of taking the backroads instead of the Interstate. This time however, the drive along Interstate 70 is absolutely not to be missed. It's sort of like viewing the Grand Canyon...for nearly 300 miles. Wild, breath-taking and uninhabited...I-70 is one of the most deserted stretches of interstates in the entire United States. So bring gallons of water, top off the fuel tank and don't drive it in the winter. But don't let that scare you. The road itself is well-paved with a speed limit of 80mph for long sections. 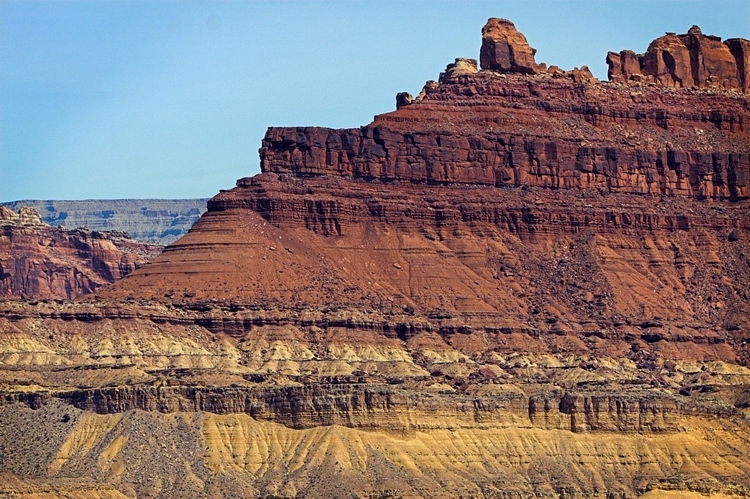 We passed through sweeping valleys, red-rock mesas, promontories and escarpments that stretch for hundreds of miles. Vast rock formations, tall as mountains, boast phenomenal million year old stratas of painter's palette colors: fiery reds, yellows, bronzes, russets, blues and sepias...all varying with the light. On the day we drove this route, the sky was a dazzling ultramarine blue with wisps of fluffy clouds floating sublimely overhead as if Mother Nature was sky-writing: "Enjoy the ride, folks." Round every bend, at the top of every crest...one jaw-dropping landscape after another. 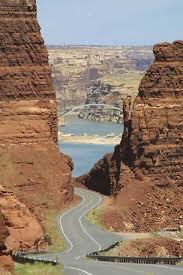 Cliffs and canyons, rivers and mountains, twists and turns, heart-stopping heights and deep gorges. Need I say more? If you ever have the chance, visit amazing Utah and be sure to go for a spin on awesome I-70. Wow, I never knew you could see so much great scenery right from the interstate. I just may have to try that some day! I agree. Utah is gorgeous!